According to Survey Freedom, you can earn as much as you want by taking surveys if you join their site. 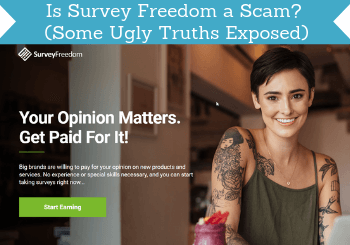 But is Survey Freedom a scam or is it really a legit way to make good money by sharing your opinion? Well, paid surveys are in general definitely a way to earn some extra cash and I have tested hundreds of sites. But let me just reveal right away that this opportunity might not be exactly what you think. That does not mean it cannot be worth it but just that you need to know exactly what you get so you go into it with the right expectations. In this Survey Freedom review, I will reveal all the details and give you an inside look so you can see and judge for yourself. What is Survey Freedom and what does the site offer? Let me just start by saying that this review is based on my personal opinion and experience after having tested Survey Freedom and compared it to all the many other sites I have reviewed here on PaidFromSurveys.com. One of the things I always look into is the background of a survey site and who is behind. For Survey Freedom there is not a lot of info to be found. All I could see is that it is a site that was started in early 2018 to help people make extra money from the comfort of their home. In the about section, it also says that they connect you with market research partners. Because I have joined so many survey sites, I immediately had an idea of what this would mean. Mostly when sites write this, it is because they do actually not really offer paid surveys themselves. But this might not be completely clear if you are not used to taking paid surveys. 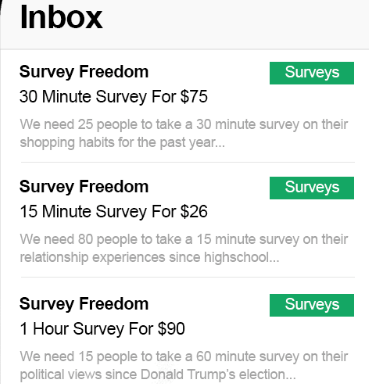 Especially because on the front page of Survey Freedom there even is an image showing you an inbox full of paid surveys. Before you join, it looks like you will get access to a lot of high paying surveys on Survey Freedom. From this, it might look like you will get access to a lot of high paying surveys by joining. But in my experience, that is NOT really what happens. So let’s look into what you actually get by joining. When you first join Survey Freedom, you have to answer a few questions so they can see how many surveys they have for you. So you answer gender, how much money you would like to make, and a few other easy questions. After this, you are then told how many available surveys there are for you. The number of surveys that supposedly are available to you. In my case, I was told there were more than 3,273 surveys from 3 providers. However, from my research and seeing what others say, it seems this is the number you will get no matter what. So seems mostly like a trick to make it look like there is an abundance of available surveys for you. After this, you are taken to the “members area”. All you get in the members area is a short list of other sites you can join. This was kind of what I expected once I saw in the “about” section that they match you with surveys. This means that you will not actually get access to paid surveys on Survey Freedom but just a small list of survey sites the get paid a commission to refer you to. Not that I have a problem with them making money like this. Everybody that has a website needs to make money somehow to be able to keep it running and I also use commission links on this website to be able to keep it running. What I do not like about Survey Freedom is that it is not clear this is what you get before you join. And in addition to this, you do not get any in-depth info about the sites to help you choose the best sites for you. You just get a short list. And then you are encouraged to confirm your email so you can start receiving survey offers from them. So what the site basically offers is that you sign up for their newsletter and then get access to a short list of survey sites and will then start receiving invitations for further survey sites. I do, however, like that they only recommend legit survey sites. I was, for example, shown I could join Survey Junkie and InboxDollars. Both of these are legit sites. I just do not like that it is not clear this is all you get before you join. Before you join Survey Freedom, you can see on the site that you can get paid through PayPal, check, or gift cards once you have earned $25. The supposed rewards as a member of Survey Freedom. This is another example of how you might then think you can earn directly on Survey Freedom. But let me just make it completely clear – you will NOT earn money directly on Survey Freedom. What they are referring to here is that on some of the survey sites you will be able to join through their links, you will be able to get these rewards. That is definitely true. PayPal as a reward is a real way to get paid on most survey sites. But you just have to know that it is NOT Survey Freedom that will pay you. Also, the information is not completely accurate. Survey Junkie actually pays you already when you have earned $10. This again shows that you will not really get any in-depth and well-researched info that can help you find the best survey options for you. But overall – yes, the survey sites that Survey Freedom recommends are real and will pay you. But to get paid you have to go and join other sites because Survey Freedom only gives you access to a small list of these sites. I want to make it clear that I do not as such have a problem with Survey Freedom making money by recommending certain survey sites, as all the sites they recommend are legit. I am also making money like this myself, as it takes a lot of time and effort to run a website so you need to pay for it somehow. What I do not like about Survey Freedom is that I think it is lacking transparency. For me, transparency is very important and in addition to it maybe not being clear that you cannot actually earn on Survey Freedom, I found some red flags that I think are big issues. So let me just show you what I found and then you can decide for yourself. Even before joining Survey Freedom I had an issue with one of the claims on the front page. Here you are told you can make as much money as you want to. You are told you can make as much as you want – NOT really true. This makes it look like you can easily make a full-time income by taking surveys. You definitely can make some nice extra money by taking surveys, but you can NOT make a full-time income and it will not make you rich. This is very important to know not to do it with the wrong expectations and end up being disappointed. When you then join, they make it look even more like you can earn BIG money. 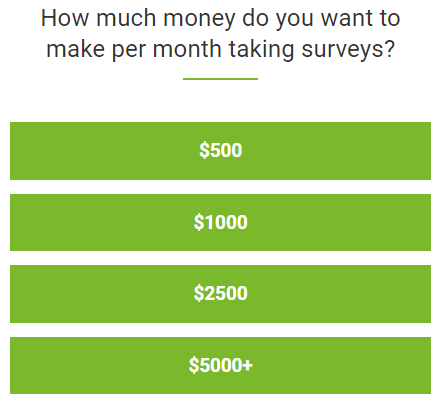 You have to answer a question about how much money you would like to earn per month by taking surveys. $5000+ is completely unrealistic on paid survey sites. Here you can even choose $5000+. This is, in my opinion, misleading. It makes it look like you can make this much money by taking surveys. Maybe you can earn $1000 if you live in a country with a lot of survey opportunities and are very active. But for the majority of people, it will not be that much you can earn. And $5000+ is simply just not realistic on paid survey sites. If you are looking to make this kind of money online, you need to look for other options than surveys. Surveys are, in my opinion, a great way to make some extra cash by sharing your opinion. But you need to do it with the right expectations. And I think Survey Freedom gives the wrong expectations about the earning potential and you need to be aware of this. On the front page of Survey Freedom, you can see some testimonials and images of supposed users that show how much money they have made from being a member of Survey Freedom. A testimonial from a supposed member of Survey Freedom. 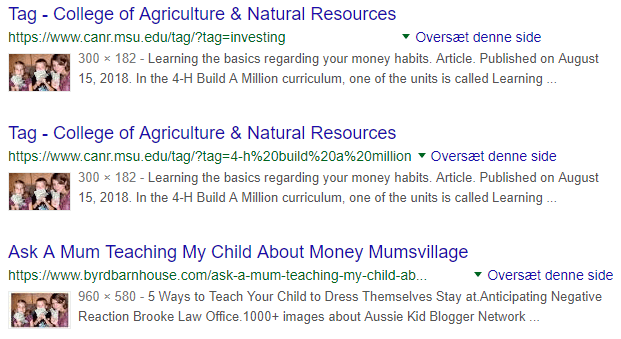 I, however, checked the image above on Google and it came up on A LOT of other websites as well. The exact same image is used on A LOT of other websites as well. This means that it is probably not a real user of Survey Freedom as the image is used on hundreds of other sites as well. When that is the case, it is likely a stock image. When a site uses testimonials that seem fake, it is a big red flag, in my opinion. I think it is dishonest and even though Survey Freedom recommends legit sites I cannot support a practice like this. That alone makes it a site I will stay far away from. It is not only some of the testimonials that seem to be stock images. After joining Survey Freedom, I got an email not too long after encouraging me to join more survey sites. At the top of the article, the link in the email took me to, there was an image of their so-called Success Manager Emily. The supposed Success Manager on Survey Freedom. Again, I checked the image on Google. The exact same image showed up on A LOT of other websites. The image seems to be a stock photo. Above you can see just a few examples. 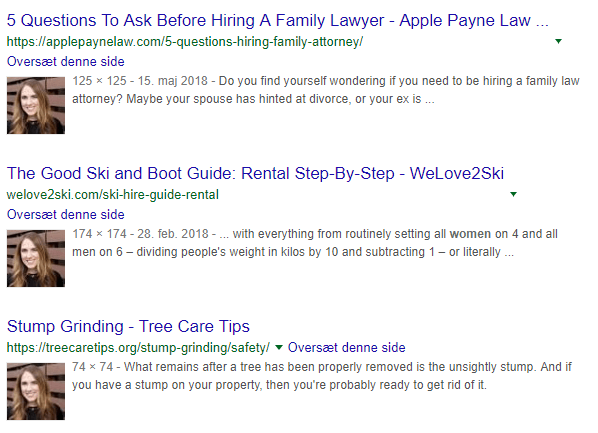 The exact same image is used for lawyer websites, a skiing website, a health care website, and much more. So it seems this image is also a stock image and that means they are not revealing the true identity of the people behind the company. Using random images to make it look like your employees is a breach of trust, in my opinion. And it shows the overall lack of transparency on Survey Freedom that, in my opinion, is a big issue. If you want to join Survey Freedom, you can do it from any country. But some of the survey sites they recommend are, however, only available in certain countries. No matter where you live, you will, however, not get many survey recommendations and you will not be able to earn on Survey Freedom itself. I think it is clear from this review what you really get with Survey Freedom. With this info, you should be able to decide if it will be worth it for you or not. To help you get a better overview, let’s finish by summing up the pros and cons. I must admit that I, in general, are not really crazy about survey aggregators like Survey Freedom that just gives you access to a small list of other survey sites you then have to go and join. I think it is an unnecessary step. There are, however, many of these sites and some of them provide good info and decent lists that can give you ideas of new survey sites to join. What I do not like about Survey Freedom, is that it is not transparent about what you get before you join. They make it look like you can actually earn on the site, they make it look like you can earn as much as you want, and they use fake testimonials. These are huge issues for me and that is why I can NOT recommend Survey Freedom. The lack of transparency is a deal breaker for me. There are so many great and transparent survey sites out there, where you can earn directly on the sites. You can, for example, check out the best survey sites in your country here. All these sites allow you to earn directly on the sites themselves and they are transparent about the earning potential. Therefore, they are way better options, in my opinion. If you have any comments, questions, or have any experiences with Survey Freedom yourself, I would love to hear from you in a comment below. The only good thing I can say about Survey Freedom is that it is only recommending legit survey sites. But the lack of transparency is huge, in my opinion. And they make it look like you can earn an unrealistic amount of money by joining when in fact, you cannot even earn directly on the site itself. There are so many great survey sites where you can earn directly on the sites and that are transparent about what you can expect, so I would clearly suggest you to join other sites instead.